On January 22, 2019, internationally-acclaimed jazz musician Branford Marsalis offered a master class for aspiring high school jazz musicians before his sold out performance at the Bankhead. For nearly two hours in the afternoon, he answered questions and shared his extensive experience, professional and personal, about the world of jazz with students from the East Bay Jazz High School All-Stars Band, an after-school musical enrichment program sponsored by the Livermore Valley Performing Arts Center. Many of their parents also attended and welcomed the opportunity to hear his perspective as well. In particular, Marsalis emphasized the importance for up-and-coming jazz musicians to find their “own sound.” He explained this as meaning that being a jazz musician is more than just playing the notes correctly. Instead, it entails incorporating the music into a personal style that connects emotionally with the audience. Marsalis likened the process to a play where an actor, after learning their lines, truly becomes the character they play on the stage – they transform from being a performer to an artist. He also encouraged students to be open in their jazz endeavors and not hold themselves back by “playing safe.” Instead he stressed the importance of pushing oneself to expand musically and not be held back by fear of temporarily sounding inferior. Marsalis also provided feedback about jazz techniques and discussed how jazz is a collaborative musical effort. It is characterized, in part, by a call and response between musicians – a form of musical collaboration. Throughout the class he shared personal stories from his years playing with such jazz greats as Miles Davis, Sonny Rollins, Art Blakey, and even contemporary stars such as Sting. The East Bay Jazz High School All-Stars is composed of a big band and a smaller combo group and is led by founder and musical director Spencer Sussman, a professional musician and composer. 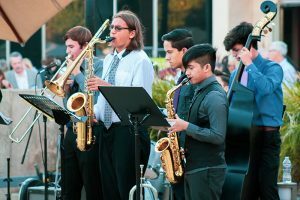 Now in its fourth season, the East Bay Jazz High School All Stars are sponsored by the Livermore Valley Performing Arts Center through the Education Program as a means to foster the talents of student musicians. The program offers the opportunity to learn and perform jazz beyond the instruction and experience they receive in school. They rehearse weekly from January through June and have performed throughout the Bay Area including at the San Jose Jazz Festival, the Bankhead Theater, the Bothwell Arts Center, and the California Jazz Conservatory among other venues. For more information about joining the East Bay Jazz High School All-Stars, seeing them perform or hiring them for an event, contact director Spencer Sussman at http://www.eastbayjazz.org. The East Bay Jazz Combo performed at the Brilliance at the Bankhead Gala in September 2018. What a great opportunity for the students of East Bay Jazz and their parents that LVPAC provided at the recent Master Class. Many of the attendees appreciated the opportunity to hear the generous musical spirit of Branford Marsalis, who passed on his long career of insights, experience and unique talents to all who attended.